The National Council of Churches in Christ, USA, representing more than 37 denominations, is sponsoring "Living Wage Days" in honor of Dr. Martin Luther King, Jr., noting that the minimum wage currently places workers more than five thousand dollars below the official poverty line. Religious leaders call this state of affairs a "moral outrage," given that one in six children in the United States lives in poverty, the majority in working families. King placed the abolition of poverty in his lifetime high amongst his many goals. One event in "Living Wage Days" will be held at the historic United First Parish Church (Unitarian) in Quincy, Massachusetts (the so-called "Church of the Presidents," as it was the home church of John Adams, amongst others), where members of Congress and others from more than 50 faith communities are to speak about how it is that in the wealthiest country on earth, those who work for a living full-time might still live in poverty. See the press release from the National Council of Churches. The Tennyson hymn "Ring Out, Wild Bells" No 149R, though technically a hymn for the New Year, boasts lyrics that speak of the dying year, and the coming of the new, which might be seasonal enough; they might be seen as well as a metaphor of a new age of which King spoke, and thus appropriate for the holiday. Most on point are the lyrics, notable considering these were written in 1849, that speak of ringing out "false pride in blood and place, the civic slander and the spite." Some in more pluralist settings may find the substitution of the word "Love" in the last line helpful. Retired United Methodist pastor John Middleton's hymn for King Day, entitled "Come, Let Us Dream (God's dream again)," many may find appopriate for post-modern worship. It is set to the tune GIFT OF LOVE (L.M. ), which is found in Singing the Living Tradition to the well-known hymn "Though I May Speak With Bravest Fire," at no. 34. Permission for local church worship has been granted; the hymn may be found here: "Come, Let Us Dream"
and guid-ed by thy hand. are both a-like to thee. Though not included in Hymns of the Spirit Two, it is included in Hymns of the Spirit Three, as "O Love, My Inmost Heart" No. 601R . Lonneke was the found­ing pre­si­dent of the Lou­doun, Vir­gin­ia, Sym­pho­ny, and serves as or­gan­ist for the Ang­li­can Church of the Good Shep­herd and for Trin­i­ty United Meth­od­ist Church, both in Par­is, Vir­gin­ia, near Washington, DC. "Pues Si Vivimos" No. 600R is an easy Mexican folk hymn, one stanza in Spanish, one in English. Congregations and congregants with even rudimentary skills should be able to make their way through these brief, simple and powerful lyrics. Guitar chords provide alternative ways for congregational singing, although the hymn is suitable for traditional hymn singing as well. Additional Spanish and English lyrics, subject to copyright, are available in other hymnals. Three hymns to the tune ST. GERTRUDE are included in Hymns of the Spirit Two (1937), including "Forward Through the Ages" by Arthur Seymor Sullivan (of Gilbert and Sullivan fame) as no. 329, the only one of the three to merit placement by the editors directly under the hymn tune. Also included are "Hail the Hero Workers" by Anna Garlin Spencer at no. 330, and lastly "Onward, Christian Soliders," by Sabine Baring-Gould, with alterations even in the 1937 collection, at no. 331. No. 330, an interesting historical piece, has not survived; nor of course has "Onward, Christian Soldiers," not merely is it absent from Singing the Living Tradition, but from many of the current hymnals published by the so-called "mainstream" Protestant churches (that it is absent from the hymnals of Catholic and Orthodox churches, perhaps to their credit, goes without saying). None of the hymns tied to the tune ST. GERTRUDE are yet included in Hymns of the Spirit Three; the question is how no. 331 should be treated therein, or even whether the hymn "Onward, Christian Soldiers" is subject to "rehabilitation" for progressive or post-liberal worship. Perhaps the passage of time will effect its own rehabilitation, but that might be a long time indeed. Readers are welcome to share their opinions and suggestions. This listing and other materials above may be printed, copied, distributed, reprinted in church or local group bulletins or newsletters, or otherwise used for nonprofit local worship or education with the inclusion of the copyright citation and the website as its source. It may not be used for profit or republication without prior permission (blondlieut@aol.com). with materials from the website www.schooloftheseasons.com. Talk of the "Kitchen God" makes one think of Amy Tan's Chinese Baptist family, and her novel The Kitchen God's Wife. A week before Chinese New Year, the head of the household makes a sacrifice to Tsao Wang, the Kitchen God; the day that before, the house is swept completely clean. In ancient times, an antelope was sacrificed, but by 1900, people offered candies and sugar cakes (so that the Kitchen God might say good things about the family, or at least become so sticky in the mouth that speaking became labored); as well as grass and beans for the God's horse. Now the usual practice is to smear honey on the picture of the Kitchen God. On this same day, people post "good wish" poems, written by professional calligraphers, usually on red paper. They say things such as "May there be a single universal peace, with true wealth and honor" or "May the spring colors of the Nine Heavens appear in profuse elegance." Save from wrath and make all pure. Wash me, Pure Love, now my cry. see you on the mer-cy throne! en el cual la-va-do fui. This hymn is particular appropriate as Christian Unity Week is celebrated from January 18 through January 25, 2006. Christian Unity Week Resouces at textweek.com Here it has been moderately revised and set to McKEE (as it has been elsewhere), an African-American spiritual. No. 219R is based on verses from Psalm 62, the lectionary psalm for this week. Translations of Mark 1:15 are many. "The time is fulfilled, and the kingdom of God has come near; repent, and believe in this good news," is the New Revised Standard rendition. Others have suggested that the Greek "metanoia" means something closer to "think again," such that the English "repent" is somewhat off the mark, thus rendering this more along the lines of "The time has come, the reign of God is at hand, is available, think again, be new-minded, and believe in this good news." Candlemas / The Presentation / Etc. 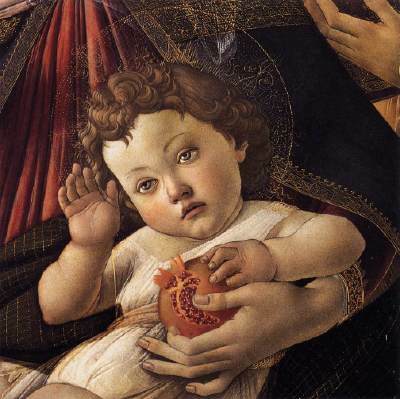 The Song of Simeon, or the Nunc Dimittis, is often associated with Candlemas (and typically used as a closing hymn), and is found at Luke 2:29-32. The following hymn, Catherine Winkworth's translation from the German, entitled "O Light of Every Nation" No. 602R, echoes this passage. Here the Christian and pre-Christian images merge-- The Annointed of God appears as the "light of every nation" and a "beacon in distress" whom we recognize, though the hopes of spring, at least in the northern half of the planet, remain still distant hopes indeed. as Sim-eon once had wait-ed on the Sove-reign to find. where your true words have promis-ed that we should find your grace. in arms of faith to bear you as did that agèd seer. physician, friend in sick-ness, in death our happiness. since I have seen th'A-noint-ed here on this ve-ry day." 11th century German mystic Hildegard of Bingen supplies the text of "I Am That Great and Fiery Force," which reads "where I breathe there is no death ... for I am Life." "Mother of All" is a recast of the Lord's Prayer in feminine imagery. The following revised hymn "Unknown, Yet Known" was originally written in 1891 (under the original name "Lord of Our Life, God Whom We Fear") by Samuel F. Smith. Smith, a Northern (now American) Baptist, attended Harvard University and Andover Theological, and was a classmate and friend of Unitarian Oliver Wendell Holmes. The hymn takes from this week's lectionary psalm, no. 111; the tune is LOUVAN (C.M.) by Virgil C. Taylor, published in Choral Anthems (Boston, Massachusetts: 1850). Life of our life, our praise receive. Throned in your vast infinity. Our souls with all your fullness fill. Your word, our guide, O gracious God! Our Light, our Life, our Love, our All. Some versions of the Bible have transformed the "fear" of God in Psalm 111 into a "reverence" for God as the beginning of wisdom; others suggest that it is God's mystery, God's unknownable quality, that in itself invokes at least some measure of (properly stated) "fear" as an initial matter in our encounters with the divine. There is something genuine about this description, not of the divine nature, but of human nature-- what we do not know is often frightening to us. But what Psalm 111 suggests is that this "fear" of the unknown and is some senses unknownable mystery that is God can be the beginning, all the same, of "wisdom," for those who seek after the divine mystery, despite the wholly (and holy) "otherness" of that mystery. Those who, of course, feel strongly about the word "fear," and wish, for example, to make the above lyrics accord with the AIV edition of the Bible, are welcome to change the second line to "God of all love; God we revere." A question asked in the entry for January 15, 2006, is whether "Onward Christian Soliders, No. 331, from Hymns of the Spirit Two, can be "rescued" for progressive or post-liberal worship. The intent of Hymns of the Spirit Three is to, hymn by hymn, rework each and every hymn from Hymns of the Spirit Two (1937), to make it "singable" today, to the extent that is possible. Hymns of the Spirit Two was originally published by two "liberal" denominations "for use in the churches of the free spirit," it was reprinted a number of times; most recently under the auspices of the Unitarian Universalist Association in 1981 by Beacon Press (the hymnal predates the existence of this "consolidated" denomination, however). More than any other text, it is clear that what follows subverts (at least in part) the intent of the original, while preserving many of the phrases and words from the original. All feedback is welcome, of course. Onward, Christian soldiers, crying "war no more!" With banners of justice going on before. Forward through thoughtlessness see that message go! Onward, faithful soldiers, crying "war no more,"
Kindred, we are treading where the saints have trod. One in hope and freedom, one in charity. Onward, faithful soldiers, crying "war no more!" With banners of justice, going on before. But the church of freedom constant will remain. Blend with ours your voices in this good-will song. This through countless ages earth and angels sing. (Above) Sixth Mount Zion Baptist was organized in Richmond, Virginia in September 1867 by John Jasper (1812-1901), who would go on to become one of the nation's best known African-American ministers. Jasper served as pastor of the church for 34 years and is remembered most for his "Sun Do Move" sermon which he later delivered by invitation more than 250 times, including once before the Virginia General Assembly. The Church still meets at the same location in Richmond's historic Jackson Ward neighborhood. Singing the Living Tradition, in contrast to Hymns of the Spirit Two, boasts an abundance of African-American spirituals and hymns. Some of these, those that are theist and Christian in nature, are above. Others, which speak more generally of freedom and other themes (without specifically invoking the divine) may be found in the index of Singing the Living Tradition, on page 654, under "African American spirituals." Most are what in the Episcopal tradition might be called "general hymns," and veritable "hymns for all seasons." Just a few, the two or three of the higher-numbered hymns, are seasonal. Given that the celebration of the African history is month-long, these are appropriate throughout February; there are many from which to make a useful selection throughout the year. Some are difficult pieces, more appropriate for choirs, such as Duke Ellington's "Come Sunday." Others, while "African American," in source and theme, are musically closer to "standard" (if there is such a thing) non-African-American hymnody associated with the Church in the 19th and 20th century, such as "Lift Every Voice and Sing." "O God Builds Up Jerusalem" is adapted from "Praise Ye the Lord, 'Tis Good to Raise," a metrical rendition of Psalm 147 by Isaac Watts (1674-1748) that appeared in The Psalms of David (1719) to the tune ACCRINGTON by William Moore. and makes the bro-ken spi-rit whole. A deep where all our thoughts are found. and no drops may des-cend in vain. and the young ra-vens when they cry. 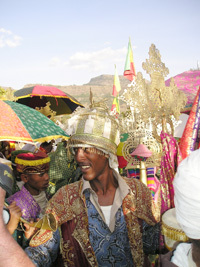 (Above) Members and deacons of the Ethiopian Orthodox Church, using liturgical umbrellas and hand-made silver crosses. The head-dresses represent the Ten Commandments. The Ethiopian Orthodox, as old as any church in Europe, believe that the Ark of the Covenant resides with them. Singing the Living Tradition contains an abundances of rounds in Hebrew, or which are otherwise traditional Hebrew melodies. One or more might be appropriate on this Sunday, in a common worship service, or in a religious education class with children. "Earth Was Given As a Garden," to the well-known Welsh tune HYFRYDOL, by contrast, has no particular Hebrew musical connection, though it echoes themes from Genesis and exhorts stewardship for the Earth. The following lyrics are based on lectionary Psalm 30, from The Psalter (1912), and have been moderately revised and set to MEIRIONYDD (7.6.7.6. D), by William Freeman Lloyd (1840). The tune is better known for being paired with "The Morning Hangs a Signal." and sought your ho-ly grace. you saints, give thanks and praise! when dawns the mor-ning light. if my life were not spared? would Truth thus be de-clared? my thanks to you I bring. On February 15, Ancient Rome celebrated the Pagan festival of Lupercalia, a fertility ritual, where after much wine-drinking and the sacrifice of goats to Lupercus, the god of fertility, people ran through the streets thouching whom they please. Easy childbirth was the petition of people's prayers. At least three (legendary) saints exist with the name St. Valentine; the most topical, perhaps, is said to have married Roman soldiers prevented by law from doing so. While this entry is being written, from within the Commonwealth of Virginia, the legislators here have decided our Jefferson-inspired constitution needs words ensuring same-gender couples are not treated as married couples under the law here (that there is a law to this effect is, apparently, not sufficient), as these are a threat to Virginia families and an affront to our state's deeply held moral values. Were this true, the editor would all the same be forced to ponder different-gender couples in Virginia whose unions have been the result of manifestly adulterous liaisons, the (sometimes Machiavellian) break-up of otherwise intact heterosexual married couples, and the children of such unions who thereafter are shuttled between the resulting households. Yet these unions, of course, regardless of their moral status or their effect on Virginia families, are given access to the "special" rights and privileges accorded by marital law in the Commonwealth. One can only speculate why it is some putatively "immoral" couples are given legal status and some are not, or why it is Virginia legislators believe themselves to be in a position to judge some Virginians "pure" or "not pure" enough to marry whom they choose (one likewise wonders when legislators in Virginia, in accord with chapter 19 of Leviticus noted above, will prohibit the consumption of fruit from tree not yet five years' old, as God has prohibited this ... or is Leviticus perhaps something some people of faith pick and choose from, as their pre-existing prejudices suit them?). One is recollected again of Jesus in the lectionary reading from Mark, who cures the leper, but in doing so not merely cures one person of a disease, but seeks more broadly to tear down the social barriers that exist between those who deem themselves "clean" and those who are deemed "unclean" and thus outcasts. God indeed, as those in the United Church of Christ might say, is still speaking ... Suffice it to say that the spirit embodied in the legends of St. Valentine might be more needed now than at any time in the past. Finally, at least one of the original "Valentines" was an influential gnostic Christian; that is, Valentinus, the author of the gnostic Gospel of Truth. 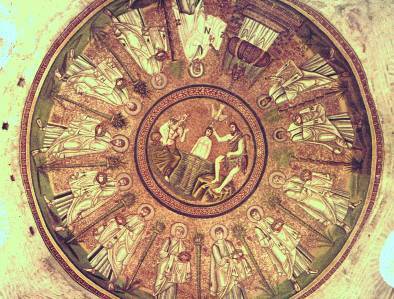 He believed that "union" of ourselves with our beloved within the holy context of the Christian bridal chamber was itself a means of spiritual purification. English poet Christina Rossetti, born in 1830 of Italian parents living in exile in England, Anglican and much influenced by the Oxford Movement to return to more "Anglo-Catholic" modes of worship, wrote Victorian verse that described an intense religious experience. The words below from her poem "Quinquagesima," in the public domain, and in 10.10.10.10. meter, might well make an appropriate (if brief) St. Valentine's Day hymn. Currently I'm thinking LANGRAN (10.10.10.10.) for "Love Alone is the Worthy Law," but any suggestions before placement in Hymns of the Spirit Three would be most welcomed. The original lyrics of this Quaker song go "since Love is Lord of heav'n and earth, how can I keep from singing;" the editors of Singing the Living Tradition having given us "since love prevails in heav'n and earth, how can I keep from singing?" The "unrevised" version may have to be placed in Hymns of the Spirit Three. from lamb to lamb, from dove to answe-ring dove. with all we lack, and all we lack is love. Saints Sergius and Bacchus, Roman soldiers, faithful couple, martyred for their Christian faith circa 303. Their feast-day on the calendar of the Roman Catholic Church is October 7. A 2005 Sermon from the Universalist Church in Stoughton, Massachusetts, examines the Presidents and religion, reviewing the (somewhat odd) overrepresentation of Unitarian and Universalist presidents and candidates to the office. One loses the "royal" designation for God, but this seems not a terrible loss in a constitutional democracy. With this few changes, "My Country, 'Tis of Thee," will be added to Hymns of Spirit Three, but no doubt in the meantime the tune will be familiar to and singable by many. Words: Adapted from Pslams of David, Brady and Tate (1812) C.M. those souls does God pre-serve. who seek to do them wrong. Each of God's promises is a "yes"
Our correligionists, within and without our denomination, are much given to the poetry and religious musing of Rumi-- Jalal Al-Din Rumi, Sufi saint, founder of (what in the West are called) the Whirling Dervishes. So much of it, even more than below, takes on the topic of Jesus and healing, in a very straight-forward way. This particular rendition has a much less miraculous cast to it, and thus serves a different audience. One thinks, of course, of another President, the crypto-Unitarian Thomas Jefferson, who literally cut apart the gospels, redacting out the portions of the good news he thought to be too incredible to be true; the resulting work, The Jefferson Bible, is sold by the UUA's Beacon Press. Adapted from the Masnavi (the so-called "Qu'ran in Persian"), Book I, 143-81. YORKSHIRE, 10.10.10.10.10.10.
ev-en your loved ones should now stay a-way." Then gent-ly asked "and which town are you from? Heal-ing de-pends on how my seek-ers come." the Teach-er spoke a-bout friend-ships and more. what fa-mi-ly and friend-ships do you share?" from lo-cal food to fea-tures of re-nown. find-ing the source of the deep a-gon-y. "So where pre-cise-ly does your love re-side?" "It's near the bridge, on the left-hand-ed side." and true faith will pro-vide a re-me-dy." at-tains it soon-er through our God Su-preme." re-lieved the pa-tient's count-less ill-ness-es. false pro-mis-es reign in our li-ber-ty. 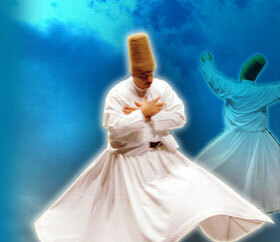 Modern dervishes, wearing the hat of the sort once worn by Rumi himself, dancing the very dance of sorrow Rumi once danced in memory upon the loss of his beloved, Shams i-Tabriz.